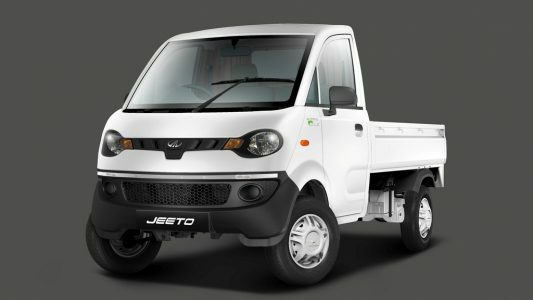 Mahindra & Mahindra today announced the launch of the CNG variant of its popular mini-truck Jeeto. Jeeto CNG aims to promote eco-friendly last mile transportation of goods and has been developed to cater to the evolving business needs of the transporters. The CNG Variant of the Jeeto will be available on the top end model of Jeeto X716. The Jeeto CNG is powered by an advanced engine that delivers class-leading power of 16 BHP and torque of 38 Nm that is offered from 1200 – 2000 RPM. This ensures superior pick-up, acceleration and climbing hill shouldn’t be an issue. This ends up allowing the Jeeto CNG to carry heavy loads even up the steepest slopes. Jeeto has a claimed best in class payload, higher deck size compared to competition, superior claimed mileage, lower maintenance, and the promise of higher earning potential. Jeeto was originally launched in June 2015 was a modular range of 8 mini-trucks to cater to the varied needs of the sub 1 tonne load segment customers. The diesel variant of the Jeeto is still available in S, L & X series and caters to the 3 wheeler, micro-truck and mini-truck customers. Jeeto delivers fuel efficiency of upto 37.6 km/l, which is the best in this segment. Jeeto has being awarded the Apollo CV of the Year Award. Amazon has chosen Jeeto as a preferred vehicle for its two wheeler upgrade program. Jeeto CNG sports a large front grille that lends it a distinguished look and the dual tone interiors along a contemporary dashboard helps things make look impressive. Ergonomics are sorted out with a large cabin which has space in every area and aids in comfortable driving. Safety comes from the addition of (ELR) seat belt systems, head restraints and bucket seat provide safety against sudden impact. The Jeeto CNG’s unmatched safety is due to its semi forward design. The Jeeto CNG has a mileage of 33.2 km/kg with best in class payload of 700 kg. Mahindra Jeeto CNG Version also comes with a warranty of 2 years/40,000km (whichever is earlier).